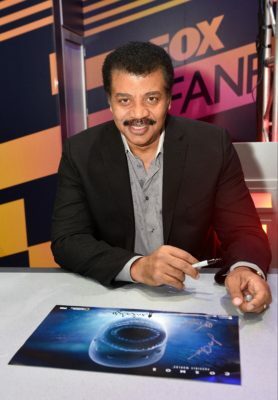 SAN DIEGO– FOX and National Geographic’s highly anticipated Emmy Award-winning series, “Cosmos” is returning in the spring of 2019. The minds behind the series, executive producer/writer/director Ann Druyan (who won an Emmy Award for writing the 2014 series and a Peabody Award for producing it) and executive producers Seth MacFarlane (Family Guy, The Orville, “Cosmos: A SpaceTime Odyssey”), Brannon Braga (The Orville, “Cosmos: A SpaceTime Odyssey,” “Terra Nova”) and Jason Clark (The Orville, “Cosmos: A SpaceTime Odyssey”), along with series host Neil deGrasse Tyson, the famed pop-culture icon, astrophysicist and host of the Emmy Award-nominated “StarTalk,” were all on hand Saturday to share the sneak peek during their panel at San Diego Comic-Con. Cosmos: Possible Worlds” is set to premiere on FOX and National Geographic in next year in March. Following a successful run in 2014 as the most-watched series ever on National Geographic Channels internationally, and seen by more than 135 million people worldwide on National Geographic and FOX, the new season will once again premiere in the U.S. on both FOX and National Geographic and globally on National Geographic in 171 countries and 43 languages. In the vastness of space and the immensity of time, the number of worlds to explore and stories to tell are virtually infinite. The first two seasons of the “Cosmos” television series transported a global audience to the farthest reaches and most deeply hidden recesses of the universe. In the course of those journeys, the series dramatized the lives of many of the forgotten searchers who contributed to the world’s understanding of who, when and where we are in the universe. “Cosmos: Possible Worlds” will venture to previously uncharted territories. In conjunction with the launch of the new season, National Geographic will publish a companion book, Cosmos: Possible Worlds by Ann Druyan, the long-awaited follow-up to Carl Sagan’s international bestseller, Cosmos: A Personal Voyage. The book is scheduled for release on February 19, 2019. “Cosmos: Possible Worlds” is produced by Cosmos Studios, the Ithaca, NY-based company Ann Druyan co-founded in 2000, and Fuzzy Door Productions, Seth MacFarlane’s company. Druyan and Brannon Braga are the series’ writers. Druyan, MacFarlane, Braga and Jason Clark executive-produce. Fans can “Like” “Cosmos: Possible Worlds” on Facebook at CosmosOnTV. Follow the series on Twitter @CosmosOnTV Photos and videos are posted on Instagram @CosmosOnTV.